CHARRED WALLS OF THE DAMNED, the brainchild of former DEATH/ICED EARTH drummer Richard Christy, will release its third full-length album, "Creatures Watching Over The Dead", on September 23 via Metal Blade Records. The first single from the album, titled "The Soulless", can be streamed below. Ask Christy what he wanted to achieve with "Creatures Watching Over The Dead", and his answer is as succinct as it gets: "To bring the metal! I want people to listen to this album, bang their head, and have fun." It's actually hard to imagine anyone with even the slightest hankering for the hard stuff not having this exact reaction when exposed to the nine tracks comprising the record — for this is heavy, catchy, anthemic and downright killer music to wreck your neck to. At the same time, it stands as one of the most uplifting contributions to the metal canon of 2016, which is both timely and welcome. With five years having elapsed since the quartet dropped "Cold Winds On Timeless Days", it's understandable that fans have been yearning for more, but they have not exactly been sitting around, kicking their heels. Christy, who has previously played with ICED EARTH, DEATH, CONTROL DENIED, BURNING INSIDE and LEASH LAW, played drums on Monte Pittman's "Inverted Grasp Of Balance", wrote music for New York State's "The Great Jack O'Lantern Blaze" event, and co-wrote a heavy metal comedy Viking rock opera with guitarist Jason Suecof and Titmouse Animation, titled "Majestic Loincloth". Suecof is, of course, one of the most in-demand producers in contemporary metal. Then there's legendary bassist Steve DiGiorgio, who made a name for himself in the ranks of DEATH, TESTAMENT, VINTERSORG, DRAGONLORD and a myriad of other great metal bands; in recent years, he has laid down his inimitable style on records from EPHEL DUATH, SOEN, MEMORAIN and others. 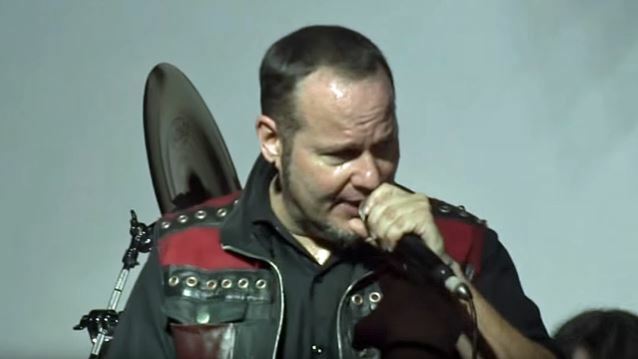 Which just leaves vocalist Tim "Ripper" Owens, who for a time fronted a little-known British band named JUDAS PRIEST — before lending his formidable pipes to ICED EARTH and Yngwie Malmsteen's mighty compositions, touring relentlessly under his own name, starting new band PROJECT ROCK. When it was time to lay the songs down, the members convened at Suecof's Audiohammer Studio, outside Orlando, Florida, and the subsequent sessions might well have been the smoothest in the history of the metalverse. With everyone more than prepared, after nailing a drum tone that sounds "so natural and crushing," Christy laid down all the drum parts in a single day, and DiGiorgio "crushed it as usual" over the space of two days, delivering an incredible performance which really shines through on every song. Suecof infused Christy's riffs with character, dynamics and sheer power as he tracked them, and then it was down to Owens, who delivered one of his finest performances - made all the more impressive by how quickly he worked. It's understandable that the four guys are seriously proud of the finished product. Once released, Christy has a simple ambition for the record, wanting "people to crank it up while they're drinking their favorite craft beer and cleaning their guinea pig's cage — which I do once a week — or mowing the lawn!"